They correspond to numbers given in the cottage descriptions below. These were "rough" cottages, as were many of that period. Except as noted, the cottages had bare stud walls inside, and had "cathedral" ceilings, the roof boards and rafters being exposed. Two or three bedrooms were cordoned off with walls of eight foot height. A "Round Oak" style wood stove was available for chilly days. Each cottage had a large porch, screened in in the latter years. A few of the porches extended over the water when the lake level was high. Early on, the kitchen equipment consisted of a kerosene oil cooking stove, a sink, a cupboard or shelves, and an icebox. Water was carried by the renters by pail from a central pitcher pump on a dependable 15' driven well. Ice was harvested in the winter and stored in an ice house with double walls insulated with sawdust. Sawdust was also used to cover the ice. Around 1930, the entire beach was wired for electricity by son-in-law Roger Johnson, who was a professional electrician. His plan called for 125 twenty five watt bulbs and 18 fifty watt bulbs. In addition - 10 radios, 16 toasters and irons, and 6 peculators. The telephone "system" consisted of a 1920's vintage hand cranked wall phone in the office. The number was Branchport 12-F-14. The party line ring was 1 long and 4 shorts! (This relic of a telephone system was still in use in Branchport until at least 1967.) If a call came in for a renter, Carrie Hall would rush out, blowing a police whistle for all she was worth! After the renters poured out of the cottages and off the beach, she would point to the wanted party. It didn't happen often, but was fun to watch when it did! The "necessary facilities" were outhouses, some still in use in 1968. Running water was piped to the southern cottage's sinks sometime in the 60's. By then, the North end had flush toilets! The water was drawn from the lake by a pump in the old ice house, chlorinated and checked daily. 1911 - "The Sandbar" #61 - built for the Campbell family. It was an "Aladan" precut cottage. The lumber was supplied cut to length, with a guarantee of a dollar rebate for any knotholes found. The cottage burned in 1987, and was replaced with a pavilion by Camp Good Days. 1914 - "Locust Beach" #65 - This large cottage was then used by the Campbell family, and their former cottage, "The Sandbar" was rented out. 1914 - "Joel Baggs Inn" #70 - Carrie Campbell Hall wrote this: "This name was given to the cottage by (a renter) John Scott Club who was the cartoonist for 'The Rochester Herald' for a long time. His cartoon for 'Joel Baggs' was an old man with long white whiskers, and under his picture was always 'Joel Baggs He sez sez he' and this was followed by some cute remark." 1917 - "Honeymoon" #68 - The first renters were newly weds. 1919 - "Red Jacket" #63 - The only two story cottage, it was Named for the famous Indian Chief Red Jacket who had lived a few hundred feet away. For years it was clad with red asphalt siding. 1919 - "Seclusion" #72 - The first of the southern cottages, quite surrounded by trees and bushes. 1920 - Juliet #74 - These two cottages were built at opposite ends of the beach, with Juliet being at the southern property line. Campbell's 19 year old daughter Grace named them. But the names didn't last - later Romeo was known as Haskell's and then Lynch's. It was torn down and replaced by a bunkhouse by Camp Good Days. Juliet became known as "Ye Old Ham", for the Oldham family who rented it. 1921 - "Elmira" #73 - popular with renters from Elmira. 1921 - "Dew Drop Inn" #59 - this was a small house moved down from one of Tom Campbell's Italy Hill farms. It had an attic, only accessible from the outside. Being an old house, it was more finished than the others. It has also been removed and replaced by a bunkhouse. "Dew Drop Inn" was a popular cottage name around the lake. 1921 - "Kum-On-Go-In" #58 - so named because the family of an early renter were always anxious to go swimming. "Come On, Go in swimming" they would shout. It was also replaced by a bunkhouse. 1922 - "The Willows" #67 - built among willow trees which were plentiful along the beach. 1923 - "Sunset" #62 - built out on the base of the sandbar with a good view to the West. To this day, it is quite well known by the Keuka laker crowd as the cottage whose wall stands in the lake. This was the last cottage built by Thomas Campbell, whose death came before the cottage was furnished. 1927 - "Halls" #66- a garage rebuilt into a cottage by Carrie Campbell's second husband, George W. Hall. It served as cottage for the Halls and the office for the business for 41 years. This cottage sported a ceiling in the large main room! 1934 - "Brookside" - a very small cottage built as a year round residence for Carrie Hall's father. It was 500 feet from the lake, between the entrance road and Basswood Creek. Later "Old John Andrews" who did handyman work for his room and board lived there. In 1972, flooding from hurricane Agnes moved the cottage some 50 feet down toward the lake. It was so well constructed that it was retrieved and moved to the other side of the drive. It had an addition built, and was where Ken & Helen Wirt stayed when they helped run the business after the Campbell's Beach days. The cottage is now gone, and a massive dining hall sits in it's place. 1959 - "Garden House" #64a - a small cottage with an interesting story. In the 1920's it was built as a boathouse down by the bay or "The Basin" as it was called. Later it was moved 500 feet ashore and fitted with a floor, becoming "The Wash House". It housed a large old washing machine used to do the washing of bedding for the beach. After that, it was used for storage. The Beach's early water supply which consisted of a pitcher pump atop a length of pipe was at the NE corner of this building. It was coverd by an attractive little trellis. In 1959, Roger and Grace Campbell Johnson converted the old wash house to a cottage, adding a large porch. The porch was built using materials from the old Penn Yan Presbyterian Church which had burned. After the subdivision of the property by a later owner, the porch was sawed in half, as a property line ran through it. Even Later it the building was moved to the corner of the field and the porch re-enlarged. It now houses Camp Good Days' staff. A newer building stands in its old location. 1963 - "Shady Rest" #66a - the core of this building originally stood across the road, over 1000 feet to the west. In the 1920's, Roger Johnson had built it as a road stand. Until the mid 1930's He and Grace sold gas, groceries, ice cream and candy there in the summertime. Later it was periodically rented out as a store or a really small residence. In 1963, the Johnsons had the 12 X 24 foot building moved down to the beach. 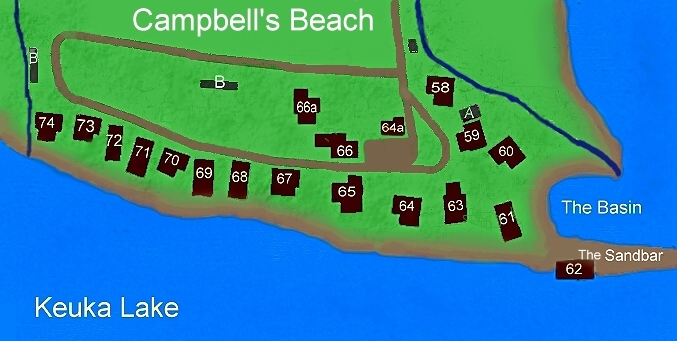 With a new addition and porch, it became Campbell's Beach' last cottage. Except for the cottage whose wall stands in the lake, none of the cottages were built on elaborate foundations. 85 to 95 years later, most of them still stand remarkably well on large flat stones which were set into the very stable beach gravel. Cottages #58, 59 and 60 have now been replaced because of Camp Good Day's need for larger bunk house type buildings. The first cottage built, #61, Was badly damaged by fire and removed. In 2008, the rest remain, most having been extensively enlarged and remodeled.